Aug. 12 — Donald Trump's unconventional presidential campaign has left some observers unsure about how his administration might approach the kind of huge merger deals that have run into problems with antitrust regulators lately. The Republican nominee has shown a disdain for big business at times and has taken on some companies directly—including Apple Inc. and Ford Motor Co.—despite his party's traditional friendliness toward corporate America and his own background as a real estate mogul. “Trump is not your typical presidential candidate, so you can’t make the sort of normal assumptions here that the Republican candidate will be more conservative than the Democratic candidate,” Stephen Calkins, an antitrust law professor at Wayne State University, told Bloomberg BNA. “To the extent that he’s running as a populist and is interested in bashing Wall Street and such, who knows whether or not that could slide over into being more aggressive on the antitrust front,” said Calkins, a former general counsel at the Federal Trade Commission. Trump's Democratic rival, Hillary Clinton, has vowed to appoint antirust regulators who will be tough on sectors that have been deemed too concentrated (147 ATD, 8/1/16). While Clinton has promised strong antitrust enforcement, it's unclear to what extent she may want to ramp it up from the current level. With Trump, the outlook is far murkier. Trump has said little, if anything, about what antitrust enforcement might look like under his administration. A campaign spokeswoman didn't respond to a request for comment. Observers said there are few clues as to Trump's thinking on antitrust issues. The campaign has barely raised the topic, outside of a dispute involving The Washington Post and its owner Jeff Bezos, who is also chief executive officer of Amazon.com Inc. In a June statement, the campaign slammed the Post's coverage of Trump and blasted Amazon as well, characterizing the online retail giant as a monopoly. “The fact is, The Washington Post is being used by the owners of Amazon as their political lobbyist so that they don't have to pay taxes and don't get sued for monopolistic tendencies that have led to the destruction of department stores and the retail industry,” the statement said. In addition to Amazon, Trump has clashed with several other major U.S. companies, showing a willingness to take on big business that is unusual for Republican candidates. Some of these other incidents have come up in the context of his “America first” message. Earlier this year, for example, Trump took Apple to task for manufacturing products overseas, saying the company should “build their damn computers and things in this country instead of in other countries.” This followed his criticism of Ford last year after the automaker announced plans to invest $2.5 billion in Mexican operations. Meanwhile, as markets await the next president, election-related uncertainty is expected to have a dampening effect on merger deals over coming months. Historically, in presidential election years with no incumbent, there tends to be a merger slow-down, particularly during the period after Labor Day through mid-November, according to Alan Klein, co-head of the mergers and acquisitions practice at Simpson Thacher & Bartlett LLP. “This year is obviously, without question, the oddest and most volatile political season we’ve seen in all of our professional lifetimes,” Klein said July 11 on Bloomberg TV’s Deals Report segment. The regulatory uncertainty has been compounded by unknowns surrounding a Trump presidency, he said. Complicating matters further, the election comes at a time of growing concern about signs of declining competition in some markets, including health care. Competition activists have welcomed government actions over the last couple of years, including recent Department of Justice litigation challenging proposed acquisitions that would consolidate the nation's five biggest health insurers into three (141 ATD, 7/22/16). Despite such enforcement steps, regulators will likely face pressure to remain active on large mergers for the foreseeable future, according to Diana Moss, president of the American Antitrust Institute, a think tank. Both the president's Council of Economic Advisers and the Organisation for Economic Co-Operation and Development have raised red flags about merger trends in the U.S. In fiscal year 2015, the number of proposed mergers valued at more than $10 billion was 67—more than double the figure from the previous year, according to the Department of Justice. 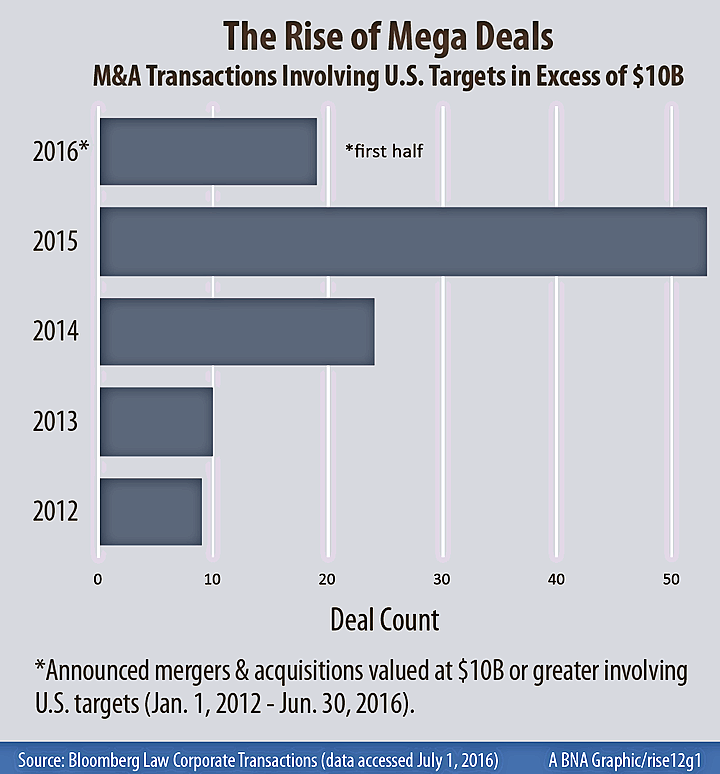 Deal volume in the first half of 2016 lagged behind the 2015 level, but exceeded the pace set in the first two quarters of 2012-2014, according to data compiled through Bloomberg Law: Corporate Transactions' Deal Analytics.